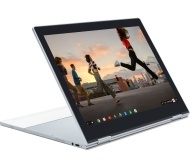 alaTest ha raccolto ed analizzato 18 recensioni su GOOGLE Pixelbook 00122 12.3" 2 in 1 Chromebook - Silver. La media della valutazione per questo prodotto è 4.8/5, confrontata con la media della valutazione di 4.1/5 per altri prodotti. I commenti su schermo e design sono generalmente positive. In aggiunta, usabilità e portabilità ottengono ottime recensioni ma ci sono alcuni commenti comuni circa dimensione. Il prezzo ha ottenuto recensioni negative. Amazingly fast and easy to use. Due to how relatively new Chrome os compared to windows and mac os there is limitations in what you can do with it. That being said Chrome os will only improve as it develops allowing for more functionality over time. Light, responsive, linux underneath. Integrates with other Google kit. Good looking. Natural to use. Sometimes sketchy integration with other kit. Large bezels on screen. Chrome OS linux kernel restrictions stop me running Docker. Would like better terminal program. App store offerings still seem weak compared to rivals. Light thin great addition to my android lifestyle. Pricey but I would still buy it. Total ease of use. Lightweight. Easy to transport around when travelling. Battery life is excellent and the time taken to re-charge is very good. Would recommend. Excellent product. It feels and looks amazing. Very well built and stylish. Screen is very good quality. Simple and quick without the issues of a windows computer.